When life seems pointless to Norton, he accepts the position of Incarnation of Time. With the other incarnations - Death, Fate, War, and Nature - already distracting him, Satan springs a cunning trap. Bearing an Hourglass is a fascinating, richly imagined tale that reaches beyond genre conventions. 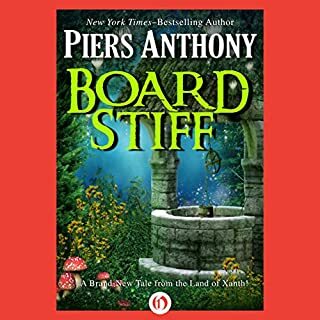 Science-fiction/fantasy legend Piers Anthony combines a gripping plot with a serious and thought-providing study of good and evil. The second in the series, this story continues w/ the Incarnations and follows the pattern from A Pale Horse. APH was a bit funnier, and BAHG is a bit more science oriented. The devil is up to his usual great tricks, characters are great, science is mostly believable, and the puns are good. Second in the series, this is a challenging book to follow, however a must read for those who bite in to the "Luna" saga. Do not miss the authors note at the end! On its own this book doesn't have the punch of On a Pale Horse, but is fill so many gaps needed to truly understand the strange view of Piers' Incarnations. Don't pass this one up, in will entertain as well as educate. This is the second book in the series. It is typical Piers Anthony writing. It is light on character development and more about problem solving. I'd say this is one of those series that reads more like a transcript of a role playing game session than a novel. It isn't bad, it isn't great. It is a passable read. I loved ythis series as a child. Maybe it is more for young adults because it didn't hold up as well as I remember. 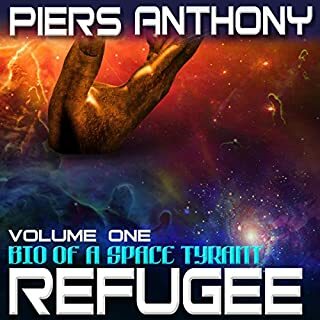 If you like Piers Anthony you will like this one. If not, you won't. it isn't bad, but it isn't anything to write home about either. 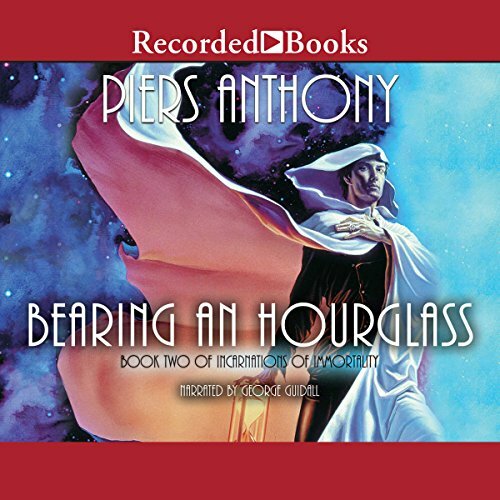 Bearing an Hourglass is the second installment of Anthony's Incarnations of Imortality series. It is set some years after On a Pale Horse. As the story opens, the solitary, nomadic Norton is enjoying a camping trip when he's paid a visit by a ghost who makes a strange request. The ghost, a young dragonslayer named Gawain who met is demise in battle with a dragon that actually turned out to be a dinosaur, is married to a young woman who lives on and enjoys all the benefits of Gawain's estate in exchange for producing an heir. Gawain's request is that Norton meet the girl and sire said heir. Though reluctant, Norton agrees to meet the young woman, Orlene. He quickly discovers that Orlene has the peculiar ability to see a person's aura, which manifests itself in the form of a glow, and to know the character of that individual based on that glow. Despite his best efforts Norton becomes attracted to Orlene and as Gawain hopes impregnates her. Not long after the birth, however, Gawain reappears with devastating news that ultimately causes Orlene to commit suicide. As compensation, the ghost arranges for the grieving Norton to have the chance to assume the office of Chronos, the Incarnation of Time. Though reluctant, Norto takes up the Hourglass and soon finds himself embroiled in the endless struggle againstSatan, the Incarnation of Evil, who seems bent on discrediting or otherwise neutralizing an influencial senator who could prove to be his greatest foe. Only time will tell if Norton will have what it takes to avoid Satan's subtle snares and keep Seator Kaftan safe from harm. All in all this was an excellent story. 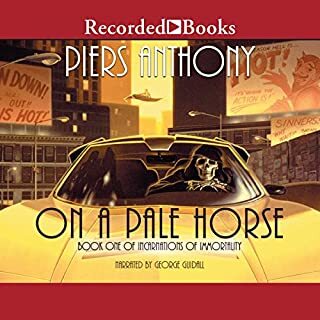 I've always enjoyed Piers Anthony's writing and George Guidall does a fine job narrating this tale. If ou haven't already done so I heartily recommend this series, particularly the first four books. These are On a Pale Horse, Bearing an Hourglass, With a Tangled Skein and Wielding a Red Sword. 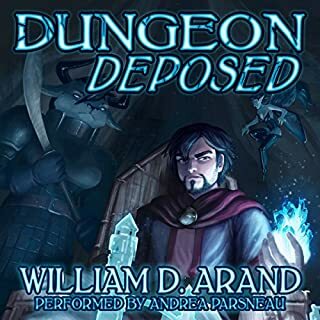 The rest are Being a Green Mother, For Love of Evil, And Eternity and most recently Under a Velvet Cloak, though this last is not currently available from Audible. The first book was great! Then, I really enjoyed the beginning of this book until the author started going on side stories that were completely cheesy and irrelevant. He makes rules but only adheres to them when it's easy. The main character in this book is an exact copy of the main character in the first book, just with a different name and backstory. This series had great potential, but I won't continue it. It took me a while to get through this book. Norton takes over the office of Chronos, I was excited for this book, but after "meeting" Norton.... I just couldn't get on board with it. He overthinks everything to a painful point. He is a strange philosopher who makes me want to scream and/or die of boredom. George Guidall did a great job narrating though, he tries his best to keep the audience pulled into the story, and his reading was a huge help to staying with the story. 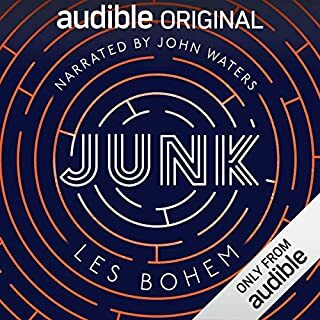 I love this series and I'm glad it was on Audible. I read this series years ago, but listening to it has brought a greater understanding. Twice as long as it needs to be. One easy question the editor should have asked: Who the hell is Bat Durston, and why does the audience CARE??? BEMS, Fems, spacemen that are human, but hundreds of light years away from the previously established sphere of human influence. This novel spends far too much time on irrelevant side characters and plots that are of no consequence to the main story line, or the main character. Also, I'm sorry, but I don't care how the hourglass works. A cursory explanation would have been plenty, but instead we get to spend the better part of a chapter delving into theory and space/time relativity. How does he travel through time and space, and stay anchored to a mobile planet? It's magic! That's it, no need to continue to delving into specific functional and technical details. The situation isn't improved by having Guidall slowly lay it all out for us in his patronizing Satan voice. I truly enjoyed On a Pale Horse, but this book is nowhere near as good. It feels like Anthony doesn't know where he is going with the character, and doesn't have enough plot to fill the book, so he meanders around with some obnoxiously pointless story lines and irredeemably stupid characters so he can have an excuse for long, unnecessarily drawn out explanations of facts or functions that the reader sorted out 20 pages ago. Piers, I love you man, Xanth was a huge part of my childhood, but you aren't a groundbreaking astrophysicist. I picked up this book because I wanted to hear a good story. Leave the abysmal side plots and physics textbook writing aside, and focus on spinning a good yarn. I'm not sure if I'll give book 3 a chance or not, this one really put me off of this series. 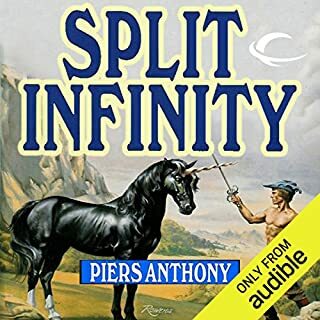 The second in the series, Anthony really does a good job on this chapter, but the multiple side plots make it seem as though he was struggling to fill in pages. They don't really detract from the main plot, but they weren't really necessary either. really unique storyline and was fun to listen too. I loved the main character. neat story concept.